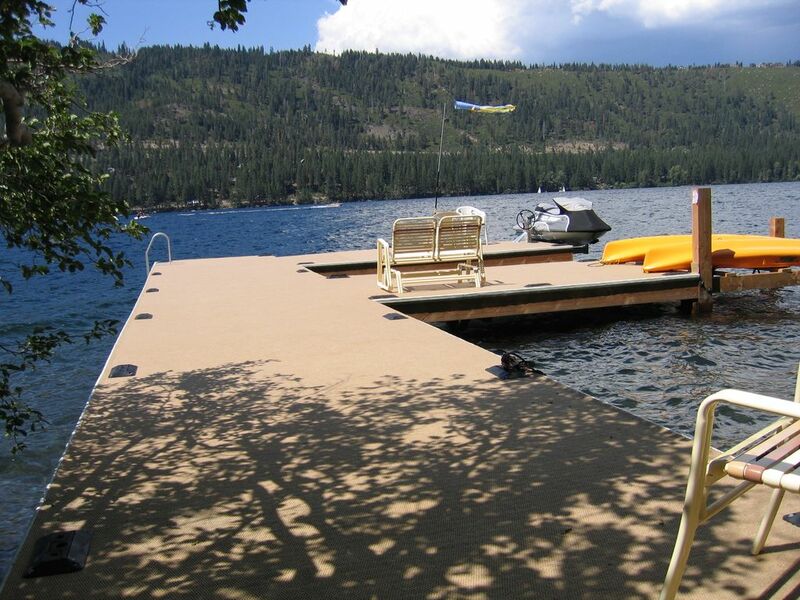 Many Donner “lakefront” properties are actually across the highway and use narrow, small, and crowded first come first serve public docks; our home is on the lake’s SHORE and the dock is PRIVATE, large, boat friendly, carpeted and comfy with a swim ladder! Thank you for your interest in our Donner Lake home. This comfortable Donner Lake lakefront 2 bedroom/1 bathroom is right on the water with large windows and beautiful lake views from every window. This is the lake level quarters of a 2 unit custom home. Wake up to a view of the lake and forested granite mountains. Walk down 3 flights of stairs and jump in the lake or cast out a line. Walk down a pathway toward the lake to the entrance. There is a living room, kitchen, 2 bedrooms, a laundry room and a full bathroom. The rental is completely self-contained. The kitchen has a stove/oven, a refrigerator, and a gas BBQ. The bath includes all the necessities. There is cable TV, a DVD player, a stereo and high-speed internet access. Go down a flight of carpeted stairs to a carpeted (soft on your bare feet and great for laying out) private dock where you can moor a boat, a PWC, try your luck at fishing, swim, or simply relax. Our home has 2 queen-sized beds and a sofa bed in the front room. We don’t want to rent to large groups. This is not a party cabin. It is perfect for a small family or a couple or two. Access to our home involves 2 flights of landscaped stone steps (caution, some may be loose!) without railings and 3 additional wooden flights of stairs with railings from the entrance to the dock. There is enough room to park two vehicles in front of the house. There may or may not be a host living upstairs at the time of your stay. The host is quiet and we have never had any complaints. You may run into him on the dock or in the parking pad. If you have any problems getting into the place just give the phone number a call or knock on the door and he will help you out. Truckee restaurants and shops are 15 minutes from the house. No smoking or pets are allowed anywhere on property. We require 100% at the time of booking to reserve nights and the completed rental agreement. A full refund is given up to 60 days prior to the first night. I stayed here with my husband and 2 kids. The dock is about the only nice and enjoyable thing about this place. The "front door" is a glass sliding door, which is down about 40 steep steps. There is no screen to keep bugs out at the "front door" there was actually no screens on two other windows in the house. Making it dangerous to open them during the day with kids around. We had so many bugs in the house from the lack of screens all around. The place had a very weird smell. The same night we checked in I had to run to Safeway and get a bunch if cleaning supplies and candles to attempt to air it out. We almost turned around and left the same night we checked in. There is about a million rules and regulations to follow hanging on the fridge, yet it doesn't seem the property owners follow them, themselves. Another thing you should know is the owner lives in part of the house. We were only allowed to park one car in the designated spot for the house, although more could fit. The owner said his Girlfriend was coming and we had to leave space for her to park. So our other car with our trailer had to park pretty far. I would think if we were renting this place we would get priority for parking. The owner seemed nice but it's a little awkward sharing the deck, parking, and house with him. Everything and I mean everything in this house is very outdated and old. We did not use not one blanket or towel of there's. Yet they took our security deposits bc we left it "dirty". The place was dirty when we arrived and we decided to not complaint and just clean it ourselves and make the best of it. The property owners blamed us for stuff that had already been broken or dirty. Will not be staying again! Samantha’s negative review is retaliation for withholding a $100 security deposit (which she did not dispute) after her group of 7 did hundreds of dollars damages. They said nothing during the stay about any deficiencies; complaints only came after we withheld a small damage deposit. We provided two premium, extra wide parking spaces in the driveway closest to the house. She parked 2 full size SUV’s & trucks after detaching their trailer. Unit is attached to a large custom home built and hardly used since the 70’s. Although aesthetic design reflects the 70’s we maintain the unit meticulously. Unit is on lower level closest to the lake and dock, requiring a trek down a trail of landscape steps from parking. Most prefer to be closer to the lake not parking lot. We sometimes occupy upper unit. Units have separate entrances and do not share living space. We try to give you your space and privacy. We keep boats at the dock and access them from there so you will occasionally see us on the dock. Screens in each room provide adequate ventilation, with optional pop up safety stops to prevent children falling out. Other windows are without screens to maximize views. Sliding door does not have a screen as it must be kept closed at all times to keep bears and animals out. She went to Safeway after her 9:30 pm arrival, not because she needed cleaning supplies for anything to do with the unit but because, they did not bring food or beverages and to purchase candles in attempts to cover smells of their cigars and dog. Samantha’s crowd had a great time and it is fortunate that we were at the property during their visit. From the moment of their arrival we spent hours helping them with personal problems at their request. We saved them hours in waiting for the auto club, loaned tools and supplied equipment for their use at the dock. Without this they would have to remove their craft from the water after each use. Rules Samantha has issue with are the same rules she agreed to when she booked. Rules are clearly posted on the refrigerator in the unit for ease of reference to all occupants. The House Rules are more helpful than oppressive and required by insurance to offer access to paying guests. Those who disregard them often needlessly struggle with tasks that can be simple and share our knowledge and lessons hard learned to maximize guests experiences and enjoyment. If a guest wants to do something differently it is a simple matter to ask and we try to accommodate. Very clean lodging. Comfy beds and all the basics are covered (except a dishwasher which would be nice). Views and pier are exceptional. Free wi-fi was a bonus. Would have given this 5 stars but structural repairs are very much needed on the front porch/deck. It would helpful in future to note that entry is through the side sliding glass door (not the front door), that way the porch/deck becomes a non-issue and you can take the left staircase and not the one that leads across the deck. Unfortunately, this property was very disappointing. First of all, the stone stairs down to the unit were dangerous (my 85 year old mother was with us). There were at least 4 loose stones, overgrown weeds and absolutely no lighting at the top of the stairs when you are there at night. When we arrived, there were crumbs all over the living room. The house cleaners had been there, as the beds were made. There were no towels on the racks. The pillows on the bed had to be 15 years old. Dirty, dingy. We arrived about an hour early and, once I spoke with the owner, a cleaning person came back over to finish the job. I was promised a refund on our cleaning fee, but have yet to receive it. The appliances, although functional, were straight out of the 70's and 80's (as is the yellow linoleum on the floors). The oven was filthy inside, the refrigerator's racks were rusted. The furniture seemed to be a collection of anything and everything. It seemed like these items were leftovers and the owners thought it would be cheap to turn this place into a rental by throwing this and that in there. The couch was very old and probably hasn't been cleaned in years. For the price that they are charging to stay there, I expect much, much more. The location of this property was the only upside to our stay. Lakefront, with a private dock. But, there are several other homes on the lake that cost the same amount and, as we discovered, were much nicer and better maintained. This property could be a gem if a little time and money were put in to updating a few things and taking care of the landscaping around it and especially the broken stairs!! Unfortunately we did have an issue with the housekeepers on this stay and the guest has been refunded the cleaning fee for their trouble. We were able to have the house properly cleaned by the normal check-in time after the entered prior to check-in time and reported the cleaning to not be up to standards. The refund was forgotten and delayed while we worked to arrange proper cleaning. We pride ourselves on prompt responses to inquiries and issues though the refund portion of this response did slip through the cracks. The number of the stairs was disclosed upon request prior to Angela's stay and we do not advertise as an easy access house. The review is accurate that the path does get dark at night as the house is remote and we try to limit light pollution to maintain the fantastic night sky views. Some of the individual stones in the landscaped stairs come loose from time to time and we do repair them when we find them but we don't have the opportunity to inspect them between every guest visit. They are by no means broken or non-functional even with several loose stones. We have added more description to the listing to help make other guests aware of the stair situation. Lastly, the house is old and the photos accurately depict some of the dated interior style and decor. We wanted peace and serenity with a private dock and we got it! The unit was clean and well maintained, we received good communication with the owners,and the directions for the cabin were easy to follow. Make sure your legs are in good shape for the 27 steps down to the cabin! We would book this again. This home is gorgeous! Its exactly as advertised. All the comforts of home. Extra linens, pots and pans. My family and I were extremely happy. As you walk down the serene steps (a few stones NEED to be replace for safety and liability issues) you are blessed with the beauty of lake donner. We entered thru the sliding glass door and were surprised to see our own gorgeous, private secluded view of the lake from every room. The first morning we woke finding a beautiful deer eating the foil age on the hill along the lake. Whether you want to relax on the dock,swim on the lake, play on boats and jet skis, take an 8 mile walk/run/ bike around the lake you can do it all... We had the cabin Monday-Sat the whole week seemed like we were the only ones there. From night and sat morning is when people fro. All over started filtering in. Still so much more private and less traffic than Tahoe. My kids are teenagers so we had to get out and find activities. If you like animals. Reno has an animal sanctuary "Animal Arc" dedicated to care for injured and non releasable wild life. Of course wild island has water slides. Go karting black light mini golf and bowling. Camp Richardson horseback riding was awesome. But what takes the cake is sitting on the dock watching the sunrise with a cup of coffee and seeing the amazing sunset when the bats come out to find their food. I Would DEFINITELY come back to this secluded hideaway. Thank you Mark and Evan for sharing your cabin with us. Swimming, fishing, and relaxing are all terrific on Donner Lake. There are great hiking and biking trails nearby. You can also rent kayaks, canoes, paddleboats, wake-board boats, and jet-skis on the lake. Nightly Rate: $199 - $450 check calendar for date specific rates and specials. Weekly Rate: $1050 - $2100 Basic Rental Rates: $350 per night (2-night minimum) plus $150 cleaning fee plus $100 damage deposit. We provide 6 towels and 3 sets of sheets. $2100 per week (6 nights) $2205 (7 nights) including 10% discount for booking 7 or more nights Holiday 3 night minimum Some Holiday nights are higher than the Basic rate. Specials and lower rates in spring and fall. Occasional Summer Specials to fill last minute cancellations.